Lead researcher and Lecturer in Human Nutrition, Dr Emeir McSorley. 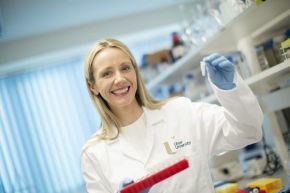 World-first research conducted by Ulster University has revealed that exposure to mercury through dental fillings or by eating seafood does not exacerbate symptoms of the autoimmune disease Lupus, a common fear of those living with the chronic condition. Systemic Lupus Erythematosus (SLE), also known as Lupus, affects approximately 25 out of every 100,000 people in Western countries and involves the immune system attacking healthy cells, tissue and organs. There is no cure for the condition and symptoms range from mild to severe, including fatigue, skin rashes and swelling of the joints, all of which can have hugely negative effects on sufferers' quality of life. The new Ulster University research found that there was no relationship between the number of dental fillings, which are known to include mercury, and the severity of the Lupus sufferers' symptoms. The research also found no detrimental relationship between mercury levels found in hair, a biomarker of mercury exposure primarily from seafood consumption, and severity of the disease. Despite lacking scientific evidence, it is widely believed that exposure to the toxic metal mercury can act as a trigger of Lupus in those who are genetically predisposed. In a world first, researchers at Ulster University's Northern Ireland Centre for Food and Health (NICHE) used human biological measures including hair, urine and dental profiling of Lupus suffers to examine the relationship between levels of the toxic metal mercury and the severity of the disease. Lead researcher, Dr Emeir McSorley from Ulster University said: "Autoimmune diseases including Lupus have been linked with exposure to dental fillings yet there is little scientific evidence to back up this claim. With no cure for the disease, those affected are continually looking for ways to better manage symptoms that can make even everyday activities extremely challenging. "While there has been significant research into the relationship between mercury and autoimmune diseases in animals, this Ulster University research is the first ever to use human biomarkers. There is no doubt that mercury is toxic for humans but results of this research are promising and should help to reassure those suffering from Lupus that their dental fillings are not advancing symptoms of their condition or further damaging their health. "We also examined hair samples of Lupus sufferers to identify levels of mercury that are linked to fish consumption. We found that patients in remission had significantly higher mercury concentrations in their hair than patients with active disease. This finding would suggest that the benefits of fish, as a rich source of fatty acids, far outweigh any negative effects of the mercury it contains, however more research is required in this area. "Going forward Ulster University aims to conduct more in depth studies into the relationship between mercury and Lupus in a bid to develop research advances that will better inform and support the community of Lupus sufferers and their families." The Ulster University research was carried out in partnership with the University of Rochester in New York with involvement of the Rheumatology Departments of the Belfast and Western Health and Social Care Trusts. It was partially funded by Department of Employment and Learning and the National Institute of Environmental Health Sciences.